Playful Endeavour in Civic Square last year. Photo: CRA. 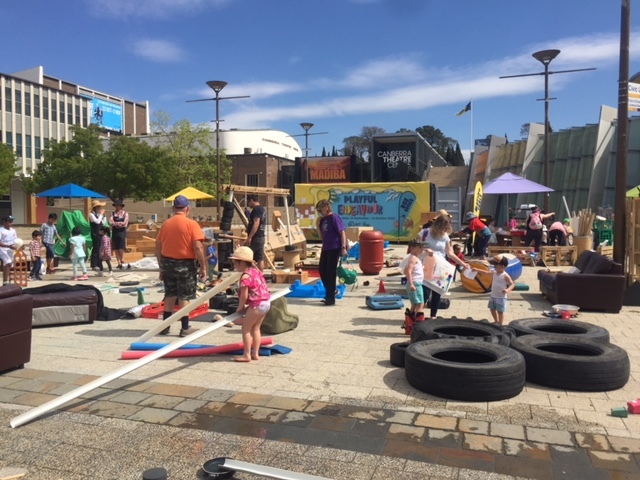 A hands-on play area with a difference is returning to the city for the school holidays, this time in Glebe Park after a successful run in Civic Square last year. Playful Endeavour, a playground of bits and pieces with which children can put their creative minds to work is operated by Green Hat Workshop, which hosts loose-parts playgrounds around the country. The range of items includes hoops, poles, pipes, crates, ropes and tyres that children can use to create their own games and activities. The playground opens on Saturday 13 April, and will be open every day until the 26 April from 10 am to 4 pm, except on Anzac Day when it will be from 1 pm, with a collection of found and manufactured materials selected to encourage creative play and social interaction. The parts are easily moved, adapted, joined and experimented with, which encourages self-directed, open-ended play, a growth mindset, interpersonal skills and fun. City Renewal Authority chief executive Malcolm Snow said activities for children were important in making Civic more attractive to families. “Good cities are full of socially connected places that welcome families and are attractive to a wide variety of people,” Mr Snow said. “We want to show people there are many great spaces in Civic that can be used to help make our city centre a family destination. “Playful Endeavour proved to be incredibly popular when we hosted it in the very urban surrounds of Civic Square last year and we are very excited to now see how children and families will interact with it in a more natural setting at Glebe Park. The event is funded through the City Centre Marketing and Improvements Levy. Caitlin Jacob, an outing for Lachie? Lydia Manen interested in Monday or Tuesday? This looks like fun Sarah! Anna Debaecker does school finish this week or did it finish last week? Gabor Hajdu but we're not on clean up!!! !